Mineral Make-Up has been all the rage the past few years so I wanted to rave and rage 🙂 about my personal favorite…Jane Iredale. Jane Iredale, considered “the skin care make up” by dermatologists and plastic surgeons, gives my sensitive (and breakout-prone) skin the perfect balance between a make up and a skin care product. In fact, all Jane Iredale products are allergy tested, non comedogenic, and do not contain irritating fillers such as talc. 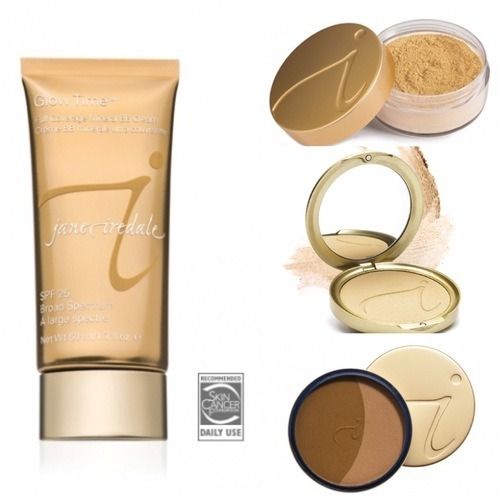 Six Jane Iredale products have also earned the “Skin Cancer Foundation Seal of Recommendation” for their sun protection factor (SPF). What I personally love about Jane Iredale is it provides exceptional coverage with a flawless finish, while still feeling light and allowing my skin to breathe. For contouring, summertime, and a bolder evening look, I add a dusting of #4 (So Bronze 2) to my temples and just under my cheekbones. This bronzer has the perfect sun-kissed hue and never looks orange. For heavier, more long wearing coverage, I have recently experimented with #1 (BB Cream 7) and have been very pleased applying it with this brush (or you can simply use your fingertips). This product is quite thick so a little goes a long way…I usually mix it with moisturizer to combat the thickness. I would definitely recommend this product if you need a lot of coverage and staying power. Jane Iredale products can be ordered online here and here and can sometimes be found at your local dermatology office or speciality cosmetics store. So, if you’re looking to try a new foundation this year, I’d definitely recommend a high quality, “good for your skin” type of product like Jane Iredale.